PI Eric Calais acquired NSF RAPID funding immediately after the January earthquake in Haiti to conduct a GPS campaign in Port-Au-Prince and other towns in the region of the main fault. UNAVCO received part of this funding to provide equipment and engineering support for the installation of six permanent, continuously operating, GPS stations in Haiti (the first of which Calais installed himself). The GPS receivers for these sites were donated by Trimble. Additionally, thanks to a partnership orchestrated by Dr. Calais, the Haitian communications company Voila provided telemetry at each permanent GPS site. All six sites are located on the rooftops of concrete buildings. The GPS antenna monuments are simple, three foot tall, single mast mounts, grouted into concrete. Each Trimble NetRS GPS receiver is located in a watertight enclosure nearby the monument. Data gathered both from Calais' campaign survey and the permanent stations will provide important information about post-seismic deformation, and ultimately, lead to a better understanding of crustal mechanics. The implications of this are far reaching. Calais and other scientists will be able to apply this knowledge to other earthquake prone regions on the globe. A better understanding of earthquakes results in improved hazards management and a greater ability to prevent disasters like that which occurred in Haiti. Figure 1 - Various members from the GPS installation team, including Voila engineer Frtiz Dare (green shirt), Frantz St. Preux from the Bureau of Mines (second from right), two drivers (second from Left and far right), and UNAVCO engineer Sarah Doelger (middle). 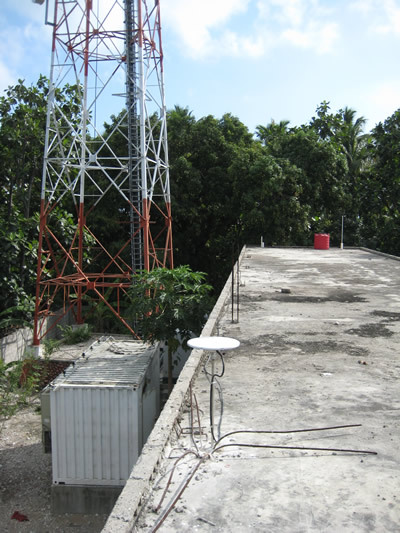 Figure 2 - A standard UNAVCO antenna rooftop mount, installed at Les Cayes, located 100 miles to the west of Port-Au-Prince. Damage in this city was significantly less than that of Port-Au-Prince. The Voila cell tower is pictured in the background. 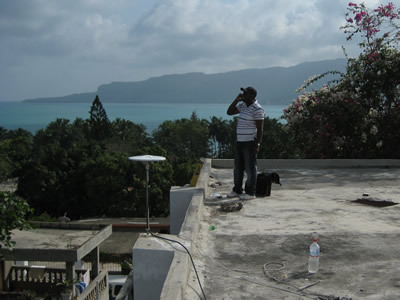 Figure 3 - In Frantz St. Preux, a geologist from the Haitian Bureau of Mines, stands near the antenna installed on the roof of the city library in Jacmel. The city is located approximately 30 miles to the south of Port-Au-Prince along the coast. This site is one of two located on the south side of the main fault. 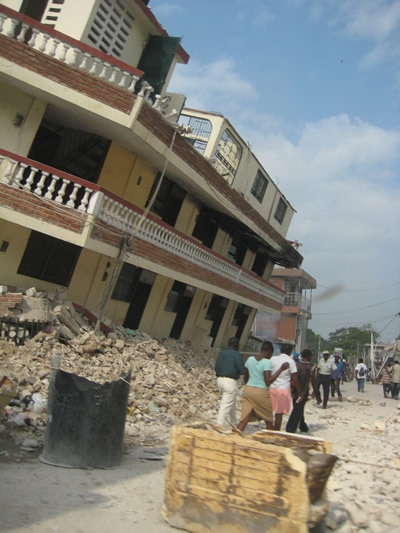 Figure 4 - Countless structures in Port-Au-Prince were completely flattened in the quake. However, some buildings lost only one or two levels, leaving the rest of the structure to fall, intact, to the ground at odd angles. The building pictured once stood four stories tall.